High performance Technosynthese®, high performance synthetic blended lubricant specially engineered for Dual Clutch Transmission (DCT) gearbox type. Suitable for use in a wide range of vehicles fitted with DCT gearboxes featuring Double-Dry Clutch Transmission and Double-Wet Clutch Transmission design. MOTUL MULTI DCTF is also suitable for some mechanical gearboxes requiring gear oil with very low viscosity grade such as SAE 75W. 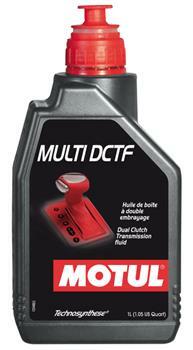 MOTUL MULTI DCTF is a high performance Technosynthese® lubricant suitable for a wide range of DCT-equipped passenger cars, including Dry DCT and Wet DCT design. Allows fuel economy for cars fitted with DCT transmissions by optimizing friction. Provides anti-shudder performance to avoid vibrations on engine fly wheel. Protects numerous gears, compact and heavily loaded. Gives superior transmission response: smooth shift feeling and no torque interruption between shifts. Improves DCT transmissions response at cold temperature. Can be mixed only with similar lubricants.